More than 10 scholars from Europe have been invited to deliver lectures on Korean popular culture in central Europe. They will be coming from universities in Austria, Germany, UK, Sweden, Romania, Poland, Hungary, and the Czech Republic. All members of academia as well as representatives of state institutions, companies, and Hallyu practitioners are invited to join the conference audience. The conference is free of charge. 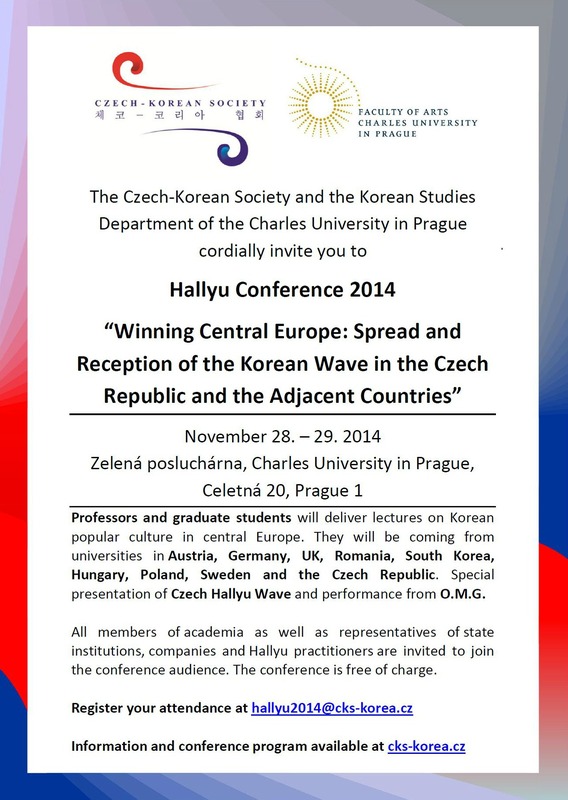 Please register your attendance at hallyu2014@cks-korea.cz by November 22, 2014. If you are a graduate student (MA/Ph.D.) and would like to present at our conference, you can join our student session. Send your paper proposal to hallyu2014@cks-korea.cz by Sept 30, 2014. More details at CALL FOR PAPERS (or view in pdf).